1982, Starring Michael Ironside, Lee Grant, Linda Purl, William Shatner, Harvey Atkin, Helen Hughes. Directed by Jean-Claude Lord. Quebec's Jean-Claude Lord has had a long career as a director, including such Francophone classics as Bingo. Today, Lord is best known for the science fiction and action films he made in English under the tax shelter laws. Among his more popular films are The Vindicator and Mindfield, starring Maury Chaykin and Michael Ironside respectively. Visiting Hours was the first Anglophone film Lord made, and like his latter films, it is bursting at the seams with recognizable Canadian talent. 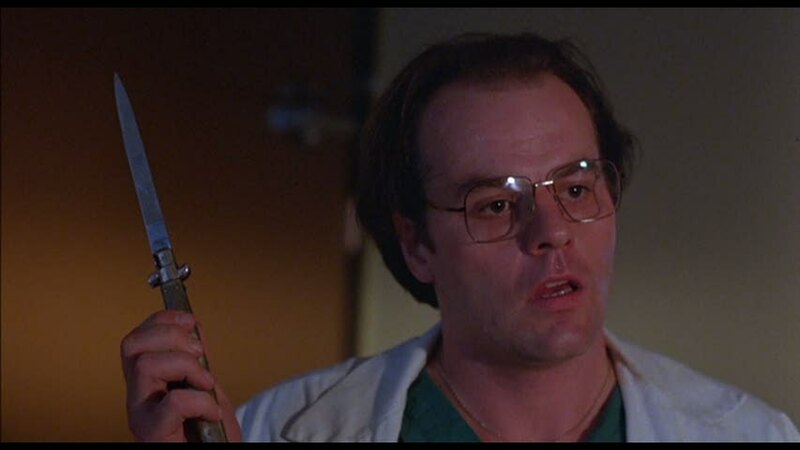 A thriller, Visiting Hours features perennial baddie Michael Ironside matching wits with an overacting William Shatner. Minor, supporting roles are capably filled by Helen Hughes (Amityville Curse), and Harvey Atkin (the nasally voice of the Leon's commercials). Deborah is a TV news reporter with decidedly feminist views, which she uses to blast the guests on her show. Shatner is her producer, who is concerned that someone may try to attack her because of her opinions. And it turns out he's right, because when she gets home that night, she finds Colt (Ironside) waiting in her shower to kill her. 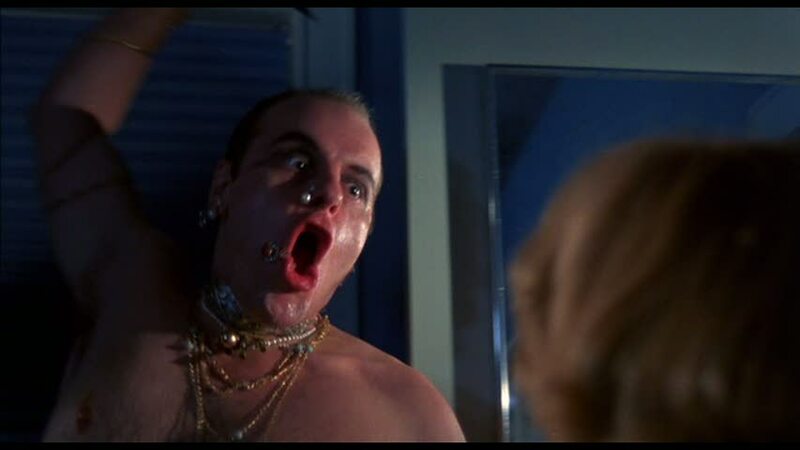 Having Michael Ironside waiting for you is scary enough, but even worse, he's wearing Deborah's clothes, jewelry and make-up. He brutally attacks her, but she manages to fight back and get away from him. Badly wounded, she is taken to the city hospital. Dejected, Colt goes back to his bachelor apartment where we learn a little about him. A loner who delights in writing angry "kill 'em all" letters to newspapers (he even has them framed throughout his apartment), the darker side of Colt is revealed in flashbacks of his father abusing both him and his mother. Perhaps that's why Colt lines his closet with his amateur photography project pictures of women in the final throes of death. On hearing that Deborah has been admitted to the hospital, he pastes a " flower delivery" sign to his van and goes in to finish the job. At the hospital, Deborah is being cared for by Sheila, a sympathetic nurse and single mom trying to make a go of it in this work-a-day world. Sneaking by the nurse's station, Colt arrives in Deborah's room only to find that she has been moved to another room. Not one to waste a good room sneaking, he cuts the airhose of Deborah's roommate, an elderly woman, and snaps a few pictures as she struggles for her life. When Sheila discovers what Colt has done, and realizes who he was really after, she calls the police. Colt escapes, but vows revenge on the meddling nurse as well. The next day, Colt returns to the hospital dressed as an orderly. 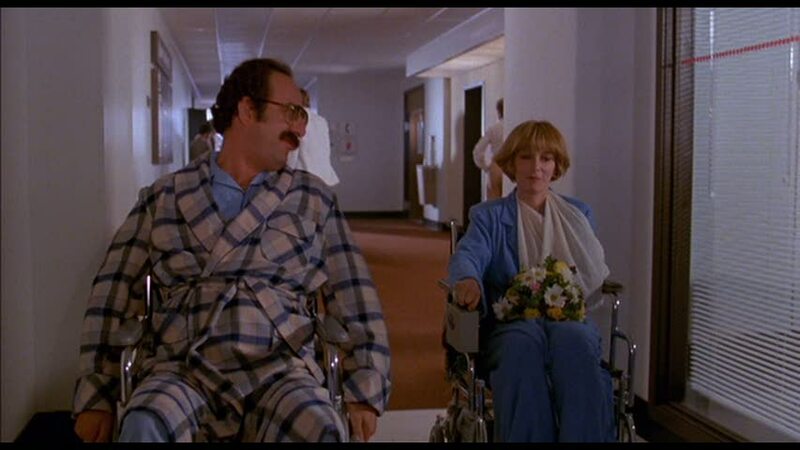 This time he finds Deborah, but the other hospital staff scare him off when she starts screaming for her life. 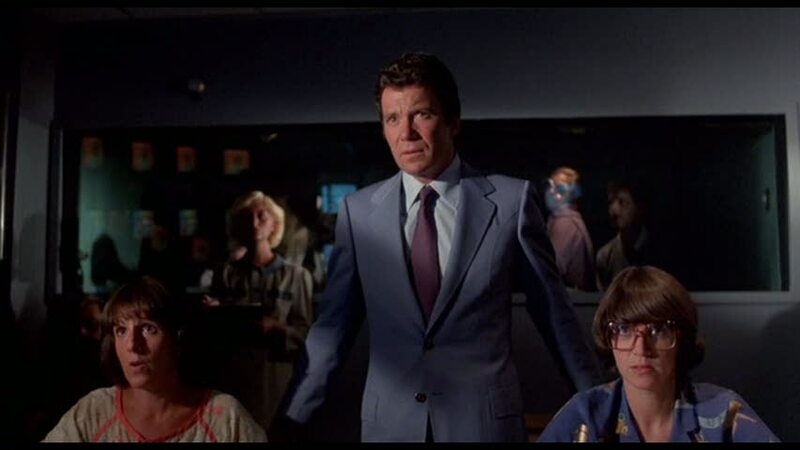 Shatner makes another appearance in the film at this point, to tell Deborah that "You've triggered a psychopath." Shatner's brief scenes in Visiting Hours, all with Deborah, indicate that he was probably only on set for a day or two. With his record at an astounding 0 for 3 on killing Deborah, Colt decides to turn his attention to that meddling nurse. Breaking into Sheila's house, he calls her at the hospital to play the voice of her daughter's doll over the phone. Mortified, Sheila rushes home and gathers her daughter and the babysitter in a locked room before facing her attacker. Colt stabs her and starts snapping pictures. Hearing Sheila's daughter, he gets distracted from the task at hand and goes after her, but intent on keeping his .000 record intact, he just goes home instead. Like Deborah, Sheila is rescued, and taken to the hospital to recover. At his apartment, Colt smashes a beer bottle and rolls his arm in the glass shards until it is all nice and bloody. Then, he calls the ambulance himself. Admitted as a patient, Colt once again tries to kill both Sheila and Deborah by chasing them into the dimly lit basement. And, once again, he fails. 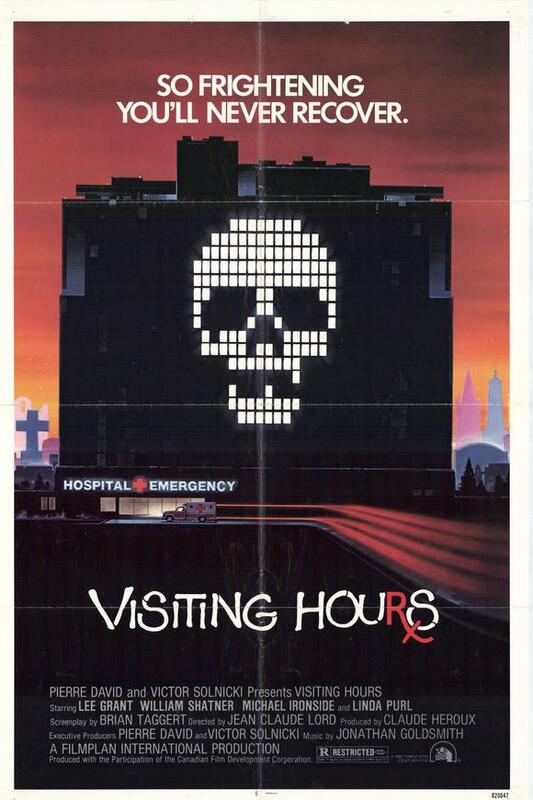 Although Visiting Hours is more of a thriller than an actual horror film, it does not have one thing in common with the Canadian slasher films of the early 1980s-- Visiting Hours does not use it's mad killer plot to espouse an opinion on morality. This film easily could have degenerated to an attack on feminism by having Deborah killed for her beliefs, or conversely it could have used feminism to triumph over Colt's misogynist rage. While it could easily be argued that Visiting Hours is a pro-feminist film, it does not spoon feed us an easy answer. Feminism is simply used to flesh out the characters, and to give Colt a reason to go over the edge. Maybe Colt needs to be more goal-oriented, because he is fairly ineffectual as far as psycho killers go. Colt is quite good at almost killing people, though. If you want someone nearly murdered, Colt is definitely the person to call. Still, what he lacks for in productivity, he makes up in effort. After more than five failed murders, not once does he give up. Unfortunately for the viewer, watching Colt fail again and again does not make for a very thrilling thriller. Visiting Hours can be a bit frustrating in this way, since the 90+ minute running time is quite obviously padded with Colt's multiple attempted murders. Perhaps this film would have worked better as a television episode than a full length movie.